New lives, new communities, new thinking, new work. The neue is everywhere in Berlin. The streets pound with drilling and digging, demolishing and rebuilding. Indisputable is the value of the newness that drives this exciting city right now. But it is a domineering voice and so loud that it is sometimes hard to hear the swell of others in the creative chorus of New Life Berlin works that deserve to be heard too. Thankfully, amongst the youth hubris that fuels New Life Berlin there are those who sing the refrain of experience. Few more so than New York avant garde artist Barbara Rosenthal, who is presently to be seen in the city trundling her large bag of cross-media tricks from which she will conjure a series of improvised live and video performances EXISTENTIAL INTERACT. She is performing this new work on the sidewalk outside KW Institute for Contemporary Art, no coincidence that ! 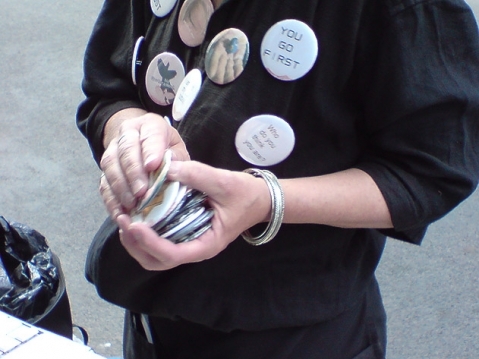 Engaging with passers by through the spoken word and offers of freebies, this work side-steps the curator and asks how such participatory art actions affect socio-cultural environments, why and how local audiences get involved and what it means when they do. Always ahead of her time, Rosenthal is probably the most experienced artist participating in the festival. For those younger artists who also make performance, as well as those who engage with it, this is a unique opportunity to interact with her work and to learn from one of the most eminent early performance artists. Some of her best known pieces such as Are You Jewish ? How Much Does the Monkey Remember, Society, are being reprised for this new audience. Recycling her stalwart props and strategies, the trademark button pins, spontaneous caricatures, the slogan cards, handouts and free fake money, this is performance art at its most direct and its most disarmingly simple. Indeed one of the slogan cards she hands out says ‘This is a simple declaration'. Beware, be aware, this is not as simple as it seems. This is guerrilla art, controversial and so in yer face you may miss it. Make sure you don't !